When assets are imported into Elvis, their metadata is extracted and added to the search index. However, the metadata in the assets can be stored according to various industry standards. Example: One standard stores tags in the 'Keywords' field while another standard stores tags in the 'Subject' field. XMP - www.adobe.com/products/xmp - The Extensible Metadata Platform is an industry standard for embedding metadata. It supports embedding all of the standards mentioned below. IPTC - www.iptc.org - The IPTC Core provides a set of basic metadata to describe and manage images. Dublin Core Metadata Initiative (DCMI) - www.dublincore.org - "Core metadata" for simple and generic resource descriptions. EXIF - www.exif.org - A standard for storing interchange information in image files, especially those using JPEG compression. PLUS - www.useplus.com - The PLUS standards provide a universal image licensing language, defining and codifying the structure and elements of image licenses. PRISM - www.prismstandard.org - An XML metadata vocabulary for managing, aggregating, and processing magazine, news, catalog, book, and mainstream journal content. Not all metadata standards use the same fields for what is essentially the same type of information. During import, Elvis extracts metadata from fields containing similar data and puts it into a generic Elvis metadata field. When exporting an asset from Elvis (for example by downloading the original file) the metadata that was moved to a generic Elvis field is placed back to the original metadata field, including any metadata that has been added when the file was edited in Elvis. A file contains the keyword 'sport'. When importing the asset into Elvis, 'sport' is added to the Tags field. More tags are added to the asset in Elvis, such as 'football' and 'soccer'. When exporting the asset, the keyword field contains the metadata 'sport', 'football' and 'soccer'. To see which external metadata fields Elvis uses as a source, refer to the Elvis - Asset info report. Note: You need admin rights to access this report. If you don't have these, see Metadata field information for Elvis 6 for a full list of the default fields. (Elvis 6.12 or higher) In the Management Console, choose Field info. 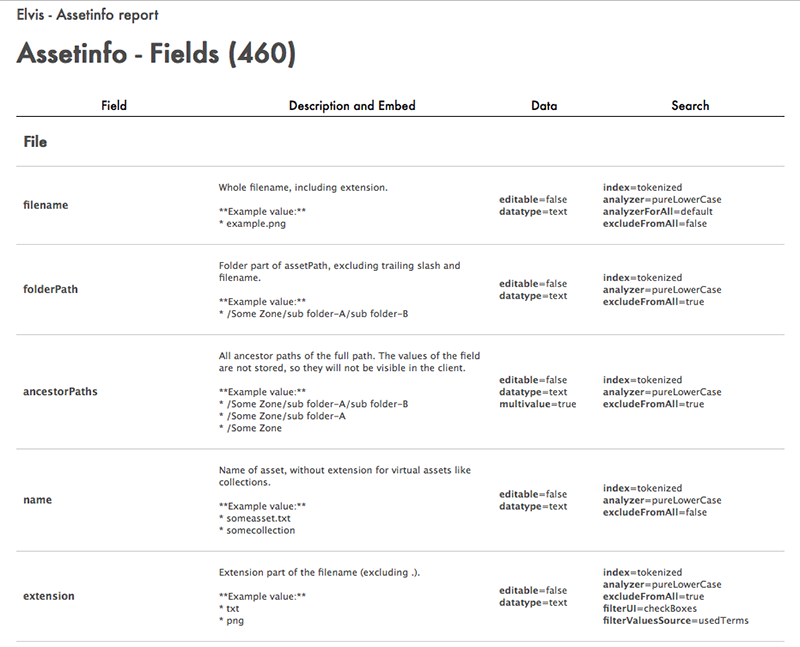 The Asset info report shows all metadata fields that are currently available in Elvis, including custom metadata fields. The 'fileFields' section is shown when the values are derived from a different metadata field in the source file, according to the structure in which the metadata is stored in that file. This means that when a PDF is imported, the values from the 'Keywords' field are imported into the 'tags' field in Elvis, if the imported file follows the XMP-dc standard, the tags field in Elvis is populated with values from the 'Keywords' and 'Subject' fields, and so on. Certain metadata is automatically embedded in the asset by Elvis, such as the ElvisID field which identifies the asset within Elvis. All metadata for an asset exists in the Elvis index so that it can be searched on, but not all metadata is also embedded in the asset itself. Take for example the 'Status' field in Elvis: it is specific to Elvis and used for tracking the asset through a workflow, but it is typically not used outside of Elvis. Embedding this field in the asset is therefore not required. For each metadata field it is possible to configure whether or not the field should be embedded. Note: Embedding metadata in an asset can negatively affect the performance of the system when many assets need to be processed.